Gallery of emotions or images of cosmetic make-up. People see and feel if features of female face express emotions non-comparable with unnatural emotional image which is created by means of cosmetic make-up. Joyful mouth - pleasant feelings. Sad eyes seem glad as eyebrows and mouth express joyful emotions. Joyful eyebrows and mouth can seem dismal as eyes express sad emotions. Eyes of the person express sad pleasure. Sad eyes and impracticable baseless desires contradict cheerful ideas and glad feelings. 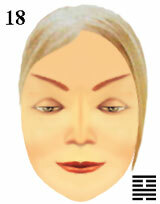 image of a female face and features of cosmetic make-up.